When an artist dies, particularly an artist who may have suspected that the end was near, there is a natural tendency to look closely at their last works in the hopes of finding some sort of statement about their life's work, if not life in general. After all, if it was one of their last chances to express something to the world, you would hope that they had something important to say. This tends to be easier in some cases than in others. It doesn't take an incredibly keen analytical mind to read the final Peanuts strip or listen to In Utero to figure out that Charles Schultz was devastated by his inability to continue his life's work and that Kurt Cobain was having a bit of a bad time. Yet even in instances where death was not imminent, there is something significant about an artist's last flourish, whether it is intentional or not. This is especially true in the case of Madadayo, the final film from one of the true masters of cinema, Akira Kurosawa, not merely because he lived for another five years without directing another film, suggesting that he might have felt that he had said everything he needed to say, but also because the parallels between the story and his own life and career run so deep. Tatsuo Matsumura plays Professor Uchida, an elderly teacher who at the beginning of the story announces his retirement from teaching German in order to pursue writing. A group of former students come to visit him and to celebrate his retirement, as well as acknowledge the tremendous he had on their lives. As it turns out, the interest of the students proves incredibly fortuitous since it is not long before Uchida falls on hard times. He retires in 1942, and his modest, charming and largely empty house (which plays host to one of many quietly funny scenes in the film in which two of the students attempt to break in to test their teacher's "foolproof" burglary deterrents; a series of funny notes joking about his minimalist existence) is destroyed in a bombing raid. Over the course of several years, the students provide financial aid and moral support to Uchida, even going so far as to have an annual dinner known as the Not Yet Fest (Madadayo translates into "Not Yet") in which they honour him by joking about how he somehow has has made it through another year. The central relationship between Uchida and his students provides the emotional backbone to the story, which is otherwise picaresque and low on over-arching narrative particularly, particularly when it comes to contrasting the joy he feels when he is surrounded by his old friends and pupils with the moments of intense sadness that make up pretty much the entire mid-section of the story. Madadayo is for the most part a pretty genial and light-hearted film, a quality that could make it seem pretty slight when stacked up against Kurosawa's historical epics, or even smaller but more emotionally fraught films like Ikiru (which is probably the most obvious ancestor for the film in Kurosawa's filmography, both in terms of tone and structure). Yet when the film delves into the darkness, it goes very deep. There is a prolonged sequence during which Uchida is overwhelmed by depression when his cat goes missing. Despite how trivial that might sound, it's actually pretty painful to watch. It's a great credit to the script (by Kurosawa and an uncredited Ishirô Honda) and the actors that this sequence works as the emotional crux of the film. Matsumura seems to shrink and almost collapse in on himself from worry and stress, transforming instantly from the funny, lively man who gleefully engaged in a raucous call-and-response with his students into a sad, hollow man. It's a stark depiction of the consuming, impenetrable heaviness of depression, and works as a beautiful case of shade and contrast, one that makes the film a much richer character study than its jovial beginnings might suggest. It's also in this darkness that the film seems to draw very clear parallels between the life of Uchida and that of Kurosawa. It's not hard to draw a connection between the two on a fairly basic level: the time period of the film - 1943 to 1960 - covers a fairly significant period within Kurosawa's own life (the only instance in his filmography in which he sets a film during his own past, as opposed to a contemporary setting or the distant past) and both are old men who pursue their artistic passion with rigourous vigour. However, there are other parallels contained within the film. Much like Uchida, Kurosawa enjoyed a period of great professional and personal fulfillment which then gave way to a prolonged period of difficulty, one marked by difficulty getting films made, and a battle with depression and even a suicide attempt. Kurosawa understood all too well the bleakness of a frustrated life, and there's a tremendous sensitivity to the way in which Uchida's struggles are depicted, one which belies the director's personal history. Also, like Uchida, Kurosawa was adored by many who learned from him, either directly or through watching his films. Two of those 'students', George Lucas and Francis Ford Coppola, even went so far as to help secure financing for one of his late masterpieces, the historical epic Kagemusha, which in turn led to a final flourish of activity in his last decade. That's not to say that Kurosawa intended Madadayo to be a strictly autobiographical work; it is, after all, based on the life experiences of a real Professor Uchida whose essays form the basis of the story. However, there are so many similarities between the two that it might explain why he might have felt a certain kinship with the material, and why he ultimately decided to make this particularly film at this particular point in his life. The film deals with themes that ran throughout many of Kurosawa's films, most notably the tension between the older, more traditional Japan and the modern one which quickly overtook it, but there's a depth of feeling throughout that suggests an emotional attachment to the story far beyond that found in his earlier films. Kurosawa was a great humanist storyteller and his films always reflected his ability to emphathise with every strata of humanity, but it was rarely felt so keenly as it is in Madadayo. There is a sense that this is a picture on which Kurosawa is raging against the dying of the light by demonstrating that he can still do great work at 83, but there's also an air of acceptance there as well. 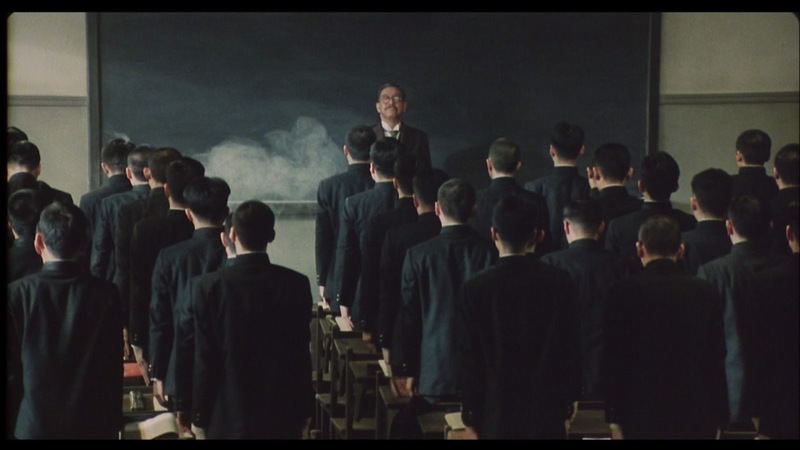 The film ends on an enigmatic note with a dream sequence in which a child representing Uchida is chased through a field by a group of other children, seemingly meant to represent his students. As he hides from them, child-Uchida looks out at the sky and remains transfixed as it shifts through a series of surrealistic shapes and patterns. It would take a psychoanalyst to parse out every possible meaning of the sequence, but emotionally, there is a sense of quiet wonder at the beauty of ever-shifting light, one which just feels right as the final image left by a man who spent over five decades shaping light so beautifully.